You didn’t think we’d go killing everyone, did you? If there’s one thing I will hang my hat on, it’s that as long as we breathe, Clarence Charles will too. Only six more pages left in Terminals. Also… last call! Rove and Ryan will be at the Calgary Expo this weekend, April 27-29, with print copies of Terminals #1-3, as well as other comics! Find us at tabes L04 & 05. Yeah! Oh don’t tell him Wynn, he couldn’t bear it! 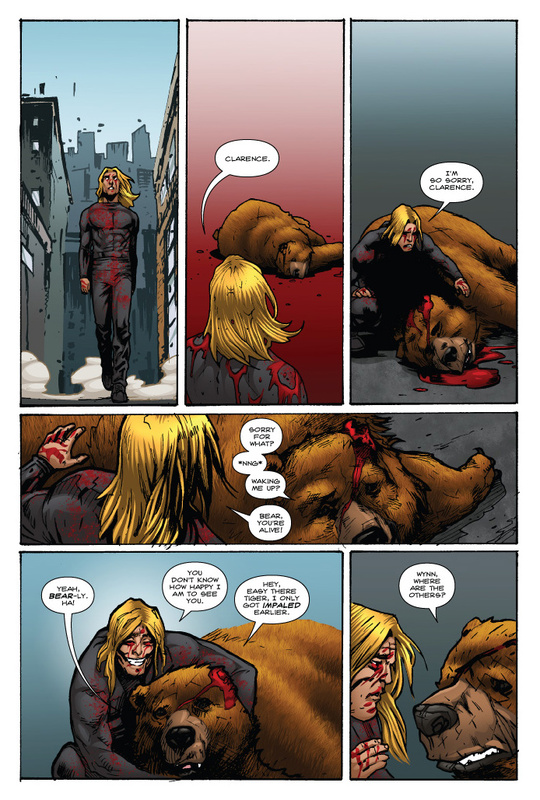 I actually forgot about Bear…. Does that make me a bad person? It’s so touching I can hardly bear it! Dagnabbit, been upstaged because my browser didn’t properly load! That’s some un-bear-ably gratuitous fan service…but I like it. The late pinpoint really didn’t have the aim to match it seems. The rumors of his demise were Bearely inadequate. I’ve probably grizzled enough folks with my Bearly concealed puns, time for the corner! Wow, that was good. Grizzling people at this point, tho’…that’s the name of the game.